The first step is to go to External Learning Tools in the Administration panel, then go to the Manage Tool Providers, and then New Tool Provider. 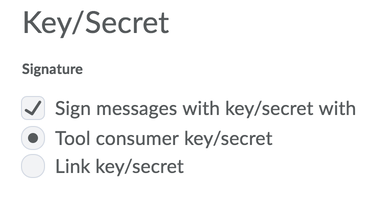 For the Launch Point you should choose https://app.peergrade.io and the Secret should be found on your institution settings page (when inside Peergrade hover your name and click Institution, then go to Settings and then LMS). 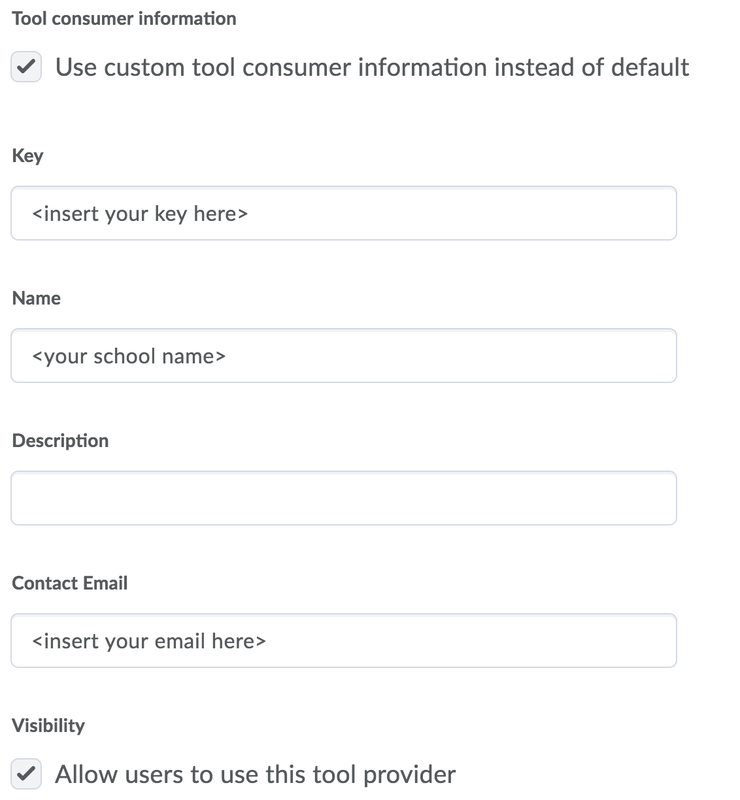 For Tool consumer information you should tick the box "Use custom tool consumer information instead of default" and set the Key to be the one found on your institution settings page. If the Name, Description, and Contact Email are already filled, leave them as is. Otherwise, set Name to the name of your school or university. Leave Description empty and set Contact Email to your email or the email of your IT administrator. As you can see in the above screenshot Visibility should be set to "Allow users to use this tool provider". Click on Add org Units, check of all units in the list and click Insert. NOTE: The Tool Provider should at least be set to be available to the same Org Units and Course Offering as the link created in Step 2. For the Description put in "Peergrade provides a simple peer feedback solution to teachers and students". Enable "Allow users to view this link". 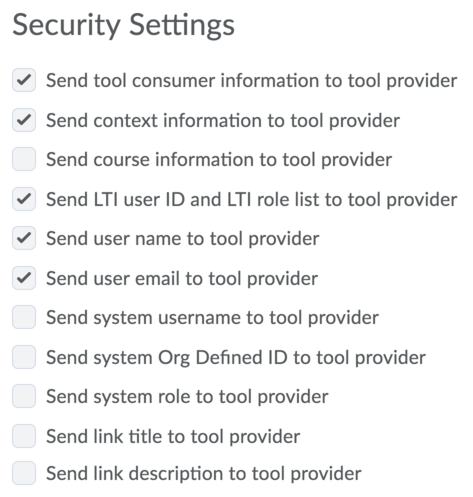 NOTE: The Tool Provider should be set to be available to the same Org Units and Course Offering as the link – otherwise the link will not work! 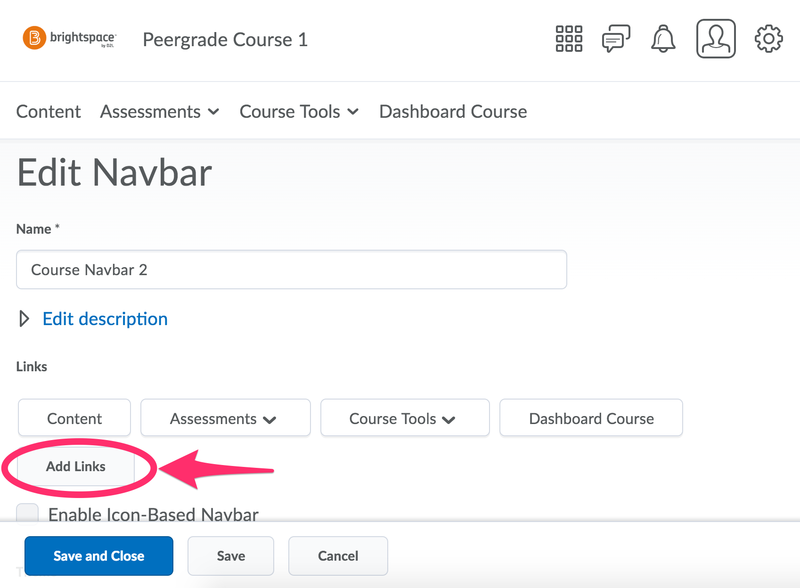 Find the Manage All Course Navbars link by hovering the right side of your current navbar and clicking the button with the three dots that appears, and then click the Manage All Course Navbars link in the dropdown. You should now choose which navbar should have the Peergrade link. 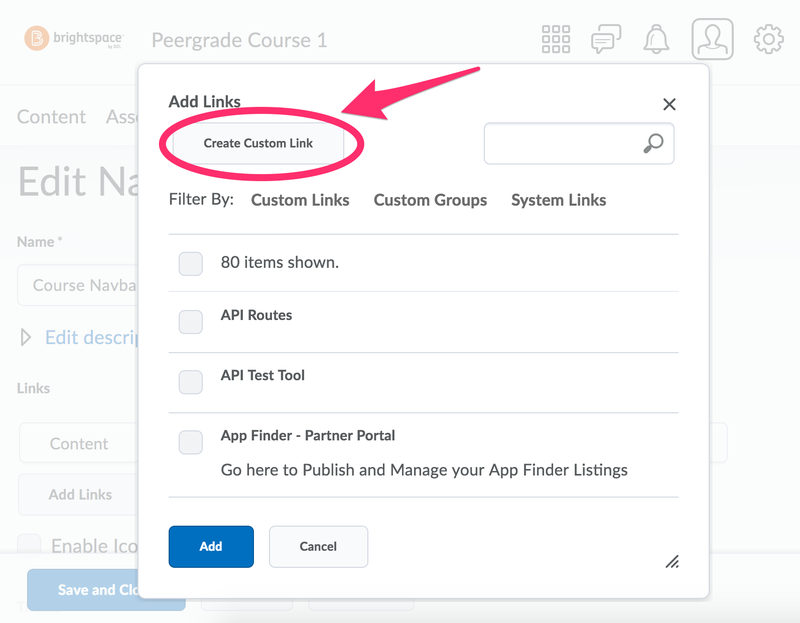 We recommend finding the default course navbar in the list and clicking that. You can also copy an existing navbar or create a new one. If you do that, teachers who want to use Peergrade will have switch to the new navbar you've created. 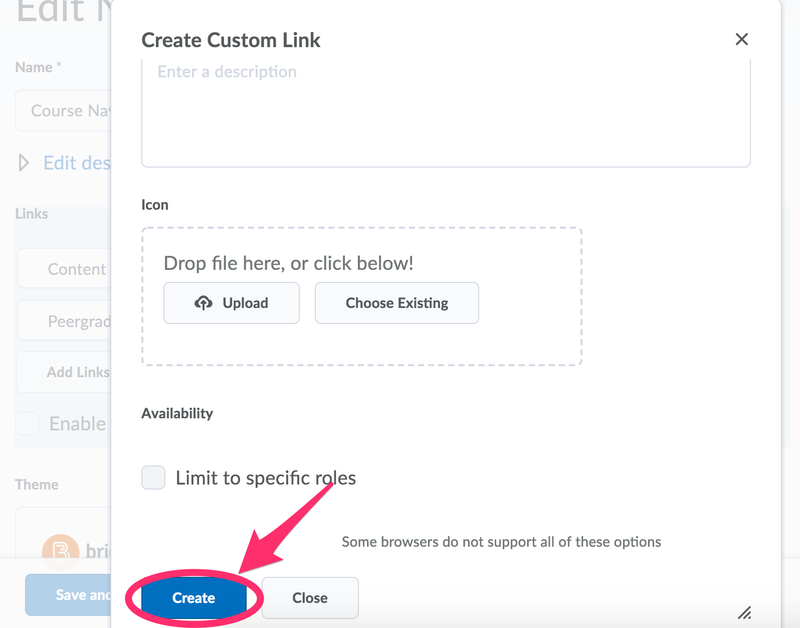 You should now be back in the Create Custom Link-modal. 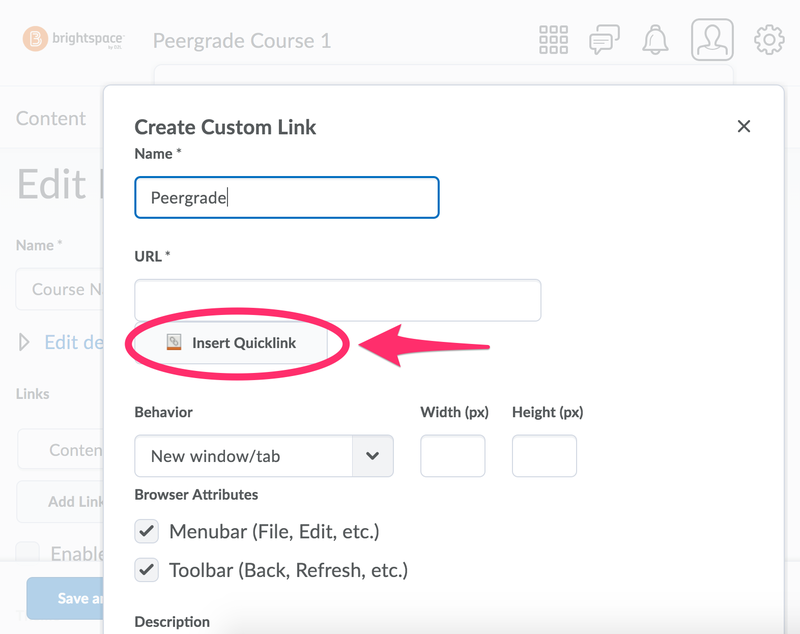 Under Behavior you can choose whether the link in the navbar should open Peergrade in a new window or inside the Brightspace UI. For best compatibility with the Internet Explorer and Safari browsers you should choose New window/tab. You do not need to enter anything in Description, nor do you need to choose an Icon. 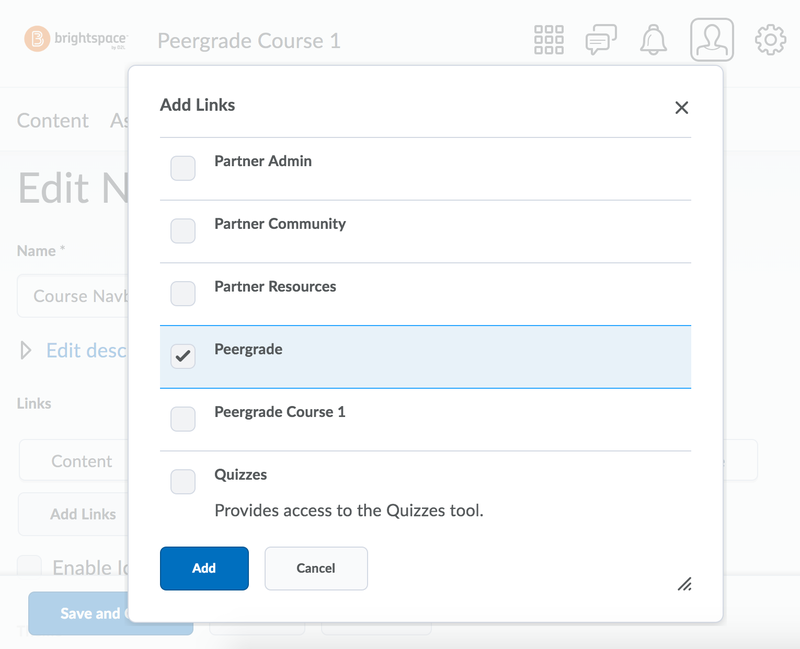 Lastly, Availability (Limit to specific roles) should be kept unchecked such that both teachers and students have access to Peergrade. Then click the Create-button at the bottom of the modal. Lastly, Save and close the navbar. 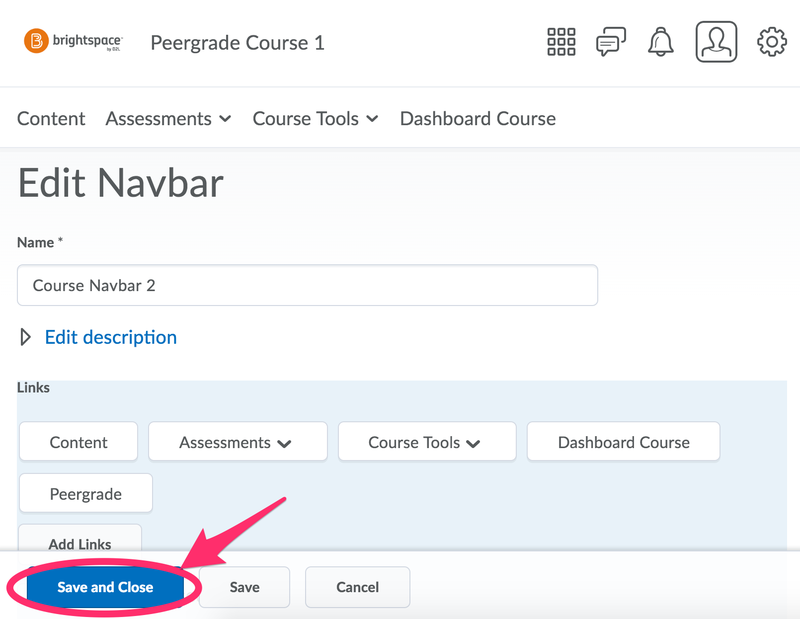 If you've edited the default course navbar all teachers will now have Peergrade available in their course navbar. If you created or copied an existing navbar, the teachers who would like to use Peergrade should switch to that navbar. 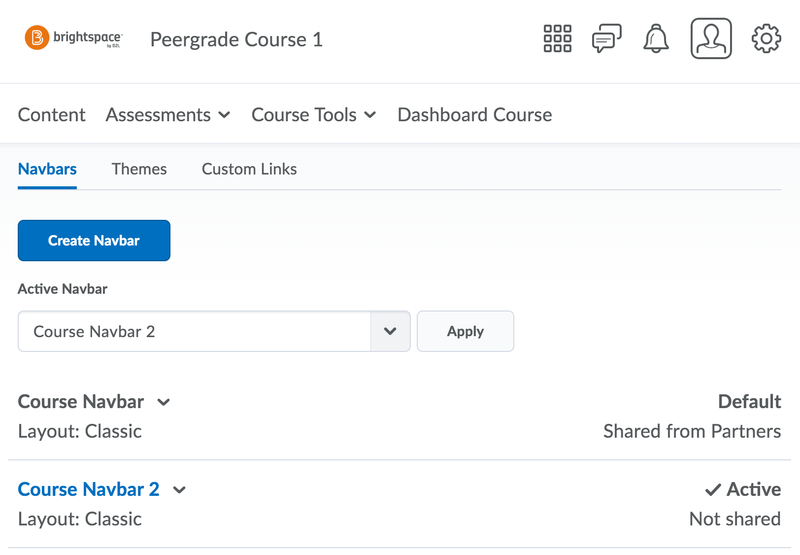 The first time you or a different teacher in the course clicks Peergrade in the navbar, you'll be asked to Connect to Peergrade by clicking a button. Once this is done you can access Peergrade through the navbar link. 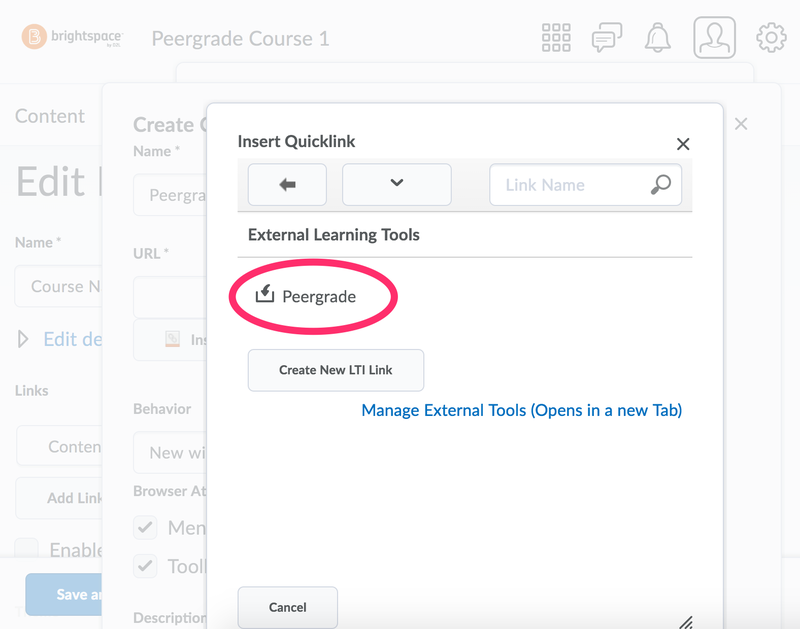 The link in the navbar is always visible to the students in the course – however – the students will not have access to Peergrade through Brightspace until you've clicked the Connect to Peergrade button. 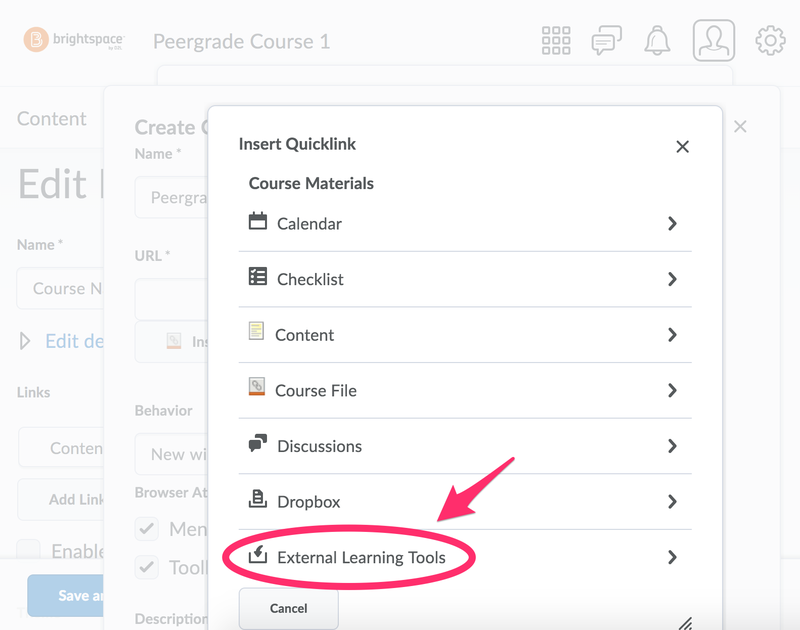 The Peergrade interface and functionality you and your students have access to is exactly the same as the "normal" Peergrade, except that it's locked to a single course that matches the Brightspace course you're in, plus we've hidden the top part of the interface (with your name and the log out link).